Nice photo of Fenway... this looks like an "official" photo. By the way, I grew up in the Boston area (Newton) and lived in Brighton, Boston, Somerville and Cambridge as a young adult, so I enjoy reminiscing about the "old country". I will be touring Fenway in just a couple of weeks. My husband is ever so excited, since he's always been a baseball fanatic. We decided not to pay $50/person for tickets for a game, but we are going to do the tour. This is a nice photo. I like the lighting. Very soft. Any recommendations of things to see in Boston while we're there? 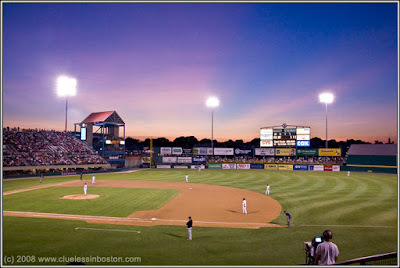 Leora Sorry to disappoint you, but this picture isn't Fenway:( I went to the Red Sox AAA affiliate in Pawtucket, RI last night and this is McCoy Stadium. Prices are a lot more reasonable than Fenway as Becky noted in her comment. $10 for grandstand tickets and $2 t park! And they play really ood baseball. Becky - thanks for stopping by. Gee, I don't know what to suggest there is so much to see and do. The Museum of Fine Arts and the Science Museum are great. One of my favorite places to visit is the Public Garden. You could start there and walk up to the Boston Common by Park Street Church and up to City Hall Plaza to see one of the ugliest buildings in Boston, namely City Hall. And then continue down to Quincy Market and Fanueil Hall. Don't miss the Holocaust Memorial near Quincy Market, I find it quite beautiful and keep trying to get a good picture of it. Then you can wander over to the North End for some touristy things like the Paul Revere House, Old North Church, burial grounds, etc. OR, just have some great Italian food in the North End. You could probably do this all in a single afternoon. BTW, my wife did the Fenway tour a couple of weeks ago and she loved it and highly recommends it. Have fun in Beantown. Minor league baseball is so captivating. Looks like the PawSox have a pretty sweet field on their hands. Great photo! So vast and open. Sport events are great to photograph, but it's the sky that's the winner in this, that mauve glow. Hi Clueless, it looks like it was a really pretty night at the ballpark--and what a great view you had, nice shot!